This is a challenging one! It’s only a short walk, but note the variability. This involves a tumble along the side of the gorge of the River Yarrow, up a little known track that makes full use of Right-To-Roam legislation! Distance: 2 to 3 miles depending on variation. Download GPX. Park at Alance Bridge, then pass through the kissing gate to walk along the well-made track to Lead Mines Clough. If you haven’t explored Lead Mines Clough before, there’s a lot to see, which cannot be done justice to in this walk. Once you head over the small bridge on the track, take a sharp backwards turn to walk back on the opposite side of the river. This is unchartered territory for many – a secret path! Tread carefully, as this is now CROW / Open Access walking, and I take no liability for what happens next… if in doubt, go home and have a brew! Walking along the path you will come to a set of wooden steps heading upwards. You can detour here slightly – if you go on a short while you will come to Meeting Of The Waters, where the River Yarrow meets Limestone Brook. If you detour, and I suggest you do, then return back to the wooden steps. Follow these up, then turn right at the top and over the stile. Now you want to head along the rivers edge at high level, taking care at all times and not taking any unnecessary risk – if in any danger, climb over the fence for a short distance to be safe! Head along the river as much as you can, where the gorge flattens out in to pasture land and a clearing where the trees thin out. This is straightforward walking now – relatively. As you follow the course of the Yarrow you will eventually hit a ruined farm with no name, and a giant stile on your right. For this reason, I call these ruins Giant’s Stile Farm. Where the river forks here, play around the stepping stones, but don’t cross them. Instead, walk up the left hand fork, and keeping the small valley to your right, walk alongside this new gorge until you reach – you’ve guessed it – another fork. I call this spot Madubu Gorge because it reminds me of a spot on Tombraider 3! Here, turn left and walk up the streamside till you get to the big farm track. 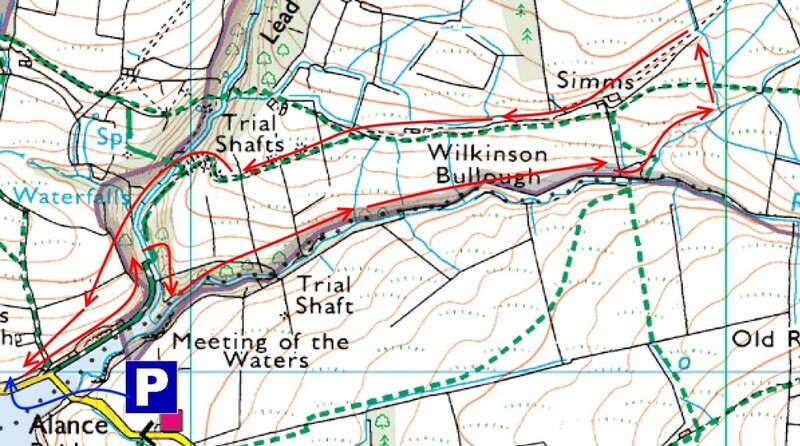 Turn left here, walk past the ruined Simms and Wilkinson Bullough, to arrive back at Lead Mines Clough. After going through the gate, head down the slope to your left, and walk alongside Limestone Clough to return to the bridge where you doubled back earlier. Now, simply retrace your steps to the car.